We have moved our Product Information to our online shop. or funding source near you! you may need a quote. 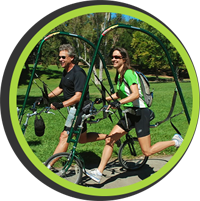 A running bike that provides weightless training taking the stress of joints and getting you active again! DEMO available for test rides in Miami, FL. For adaptive cycling accessories such as supportive bike seats with harnesses, pedals that will help hold your child's foot in place or crank shorteners or pedal blocks to help riders with less than a 25 inch inseam to reach the pedals, please visit our DEALERS PAGE and contact any of the bike shops labeled with ADAPTIVE CYCLING. These shops have staff that are knowledgeable about accessories that will work with the Buddy Bike.